The Haze Vaporizer is a game changer in the world of portable vapes. No more trade-offs, no more being tied to an electric outlet, no more sessions re-packing your bowl 10x. 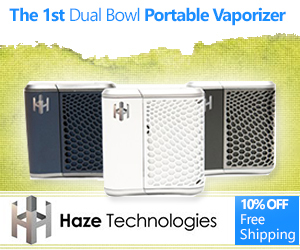 With the Haze, you have a stealth, high powered, mobile vaporizer than can deliver like a traditional desktop unit. 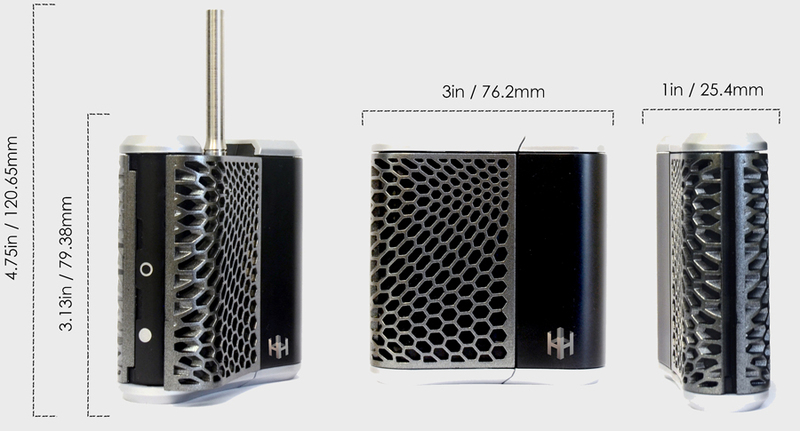 The Haze has the best of both worlds for smokers by combining a convection screen & a conduction screen. This allows for a more personal vaporizing experience. Both screens are crafted from stainless steel. The conduction screen has been left with two sides open, allowing dry materials to have controlled exposure to the heating chamber. The convection screen is surrounded by four walls of stainless steel, but allows no direct contact between materials and the heating chamber. The Haze also allows for pre-packaged chambers. The heating chambers and screens are large, safe, and innovative enough so you can pre-pack your materials into the reservoirs before you ever leave the safety of your home! Two chambers also means double the capacity of what you can pack into a single session. Sometimes, it may seem confusing as to how the Haze could possibly support two different chambers, with two different temperatures, for two different materials. To be able to heat up two different materials that require two different temperature setting, Haze employs a unique heating exchange system that efficiently pre-heats the outside air, and then cools the vapor down before it reaches the mouthpiece. The Haze also features a long-lasting external lithium ion battery for prolonged vapor sessions. These long sessions can be attributed to more than just a long battery life; it is also due to the use of the dual bowl technology, heat exchange system, and a confined vaporization concept. You can easily travel for an entire weekend or more and not need to recharge the unit. Or you can carry a couple of backup batteries with you if you plan on a longer trip. 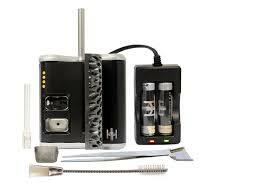 Lastly, Haze comes with one of the more interesting and practical accessories for portable vaporizers on the market. The all-purpose cans work with any material you wish to vaporize, depending on how you utilize the can. The cans are made of stainless steel with a food grade silicone lid on the top. The material reservoirs contain a wick for you e-liquids and essential oils, but are removable so you can vape your waxy concentrates and dried herbs. These reservists provide a confined and pure tasting vapor. They also function similar to cartridge, in the sense that you are able to pre-pack them. The pre-packaging takes away any awkward stops you may have to make when vaporizing on the go! Instead of worrying about re-packaging or cleaning, simply swap out the reservoirs for fresh ones. 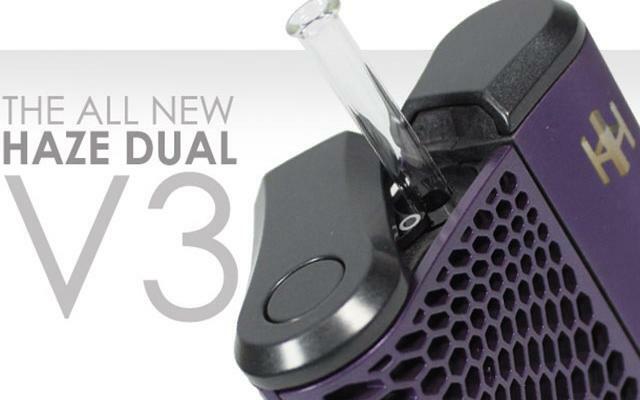 The Haze Dual v3 is compatible with dried herbs, concentrates, and e-liquids. Each box is complete with 4 screens (2 conduction and 2 convection) for dried herbs, and 2 all-purpose cans. These cans include a rubber cap and cotton wicks for oils and liquids. To use with concentrates and waxes, simply remove cotton wicks and place dab on the bottom of the can. You can also remove the cotton wicks and drop in solid buds of your favorite herb for another portable option. Simply add materials to the bowl or screen and place into the chamber. Use the top switch to power on and select either bowl A or bowl B. The Haze temperature selector button is located on the top of the device which gives you 4 temperature options to vape your material with. When powered on, the LED light will blink several times to indicate that the device is in the process of heating. When the oven is at the selected temperature, the LED lights will remain solid. At this point, the unit is ready to begin vaporizing. The Haze mouthpiece is stored inside the unit to prevent it for getting lost or broken. A simple flick of the wrist will be enough to slide the mouthpiece from the top chamber, located by the bowl selector icons. For more information see the product video. How Does It Compare To The Best Portable Vaporizers? The Haze portable vaporizer is primarily a hybrid of convection and conduction style vaporizers, so you get the best of both worlds. 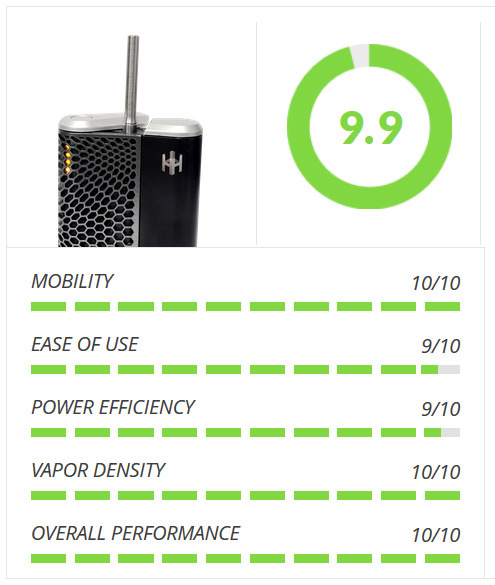 It has been selected as a smart buy 3 years in a row by BestPortableVaporizer.com. Your dry material never has direct contact with the heating chamber since it sits in a stainless steel screen bucket and the screen is in direct contact with the heating chamber. Heated air flows through the herb making it extremely healthy to vaporize. The air-path is not all glass but it has a patented enclosure which isolates it from the internal device. With the glass mouthpiece, it delivers the purest taste possible. The patented heat exchange system is what makes this vape superior to anything else on the market- including like the normal best sellers Pax, Solo or Mighty vaporizers. As compared to the Pax unit, which has a restricted air path which makes each draw very hard similar to a large milkshake, you will notice that the air path on the Haze is very open and allows smooth drawing. Also, the Pax mouthpiece can get extremely hot if you take deep draws, but with this vape you will notice that the mouthpiece stays cool at all times. With the Arizer Solo, our advantage over Solo is the fact that we have 1.5 to 2 times more herb space (two bowls combined). Not to mention, the portability aspect as the Haze is half the size and half the weight of the Solo which makes us extremely easy to go with you on the go. Our battery is twice as efficient as the Solo’s too, and this is due to our size and heat exchange mechanism. The Haze can use Oils and Herbs in the same session. The Solo and Pax is dry herb only. Pax and Solo has internal batteries. We have external ( 2 batteries come in the package). It means that If you take Pax or Solo to hiking, camping or a concert, you will need to find electric source (wall, car etc) to charge those. Ours, you can take several fully charged batteries with you and you can vape all weekend without a need to charge batteries. That is a first for dual portable vapes and on par with the Herbie and the Extreme Q from Arizer which was voted as the best desktop vape in the market. As of 2017, the Haze is still the undisputed leader in technology. 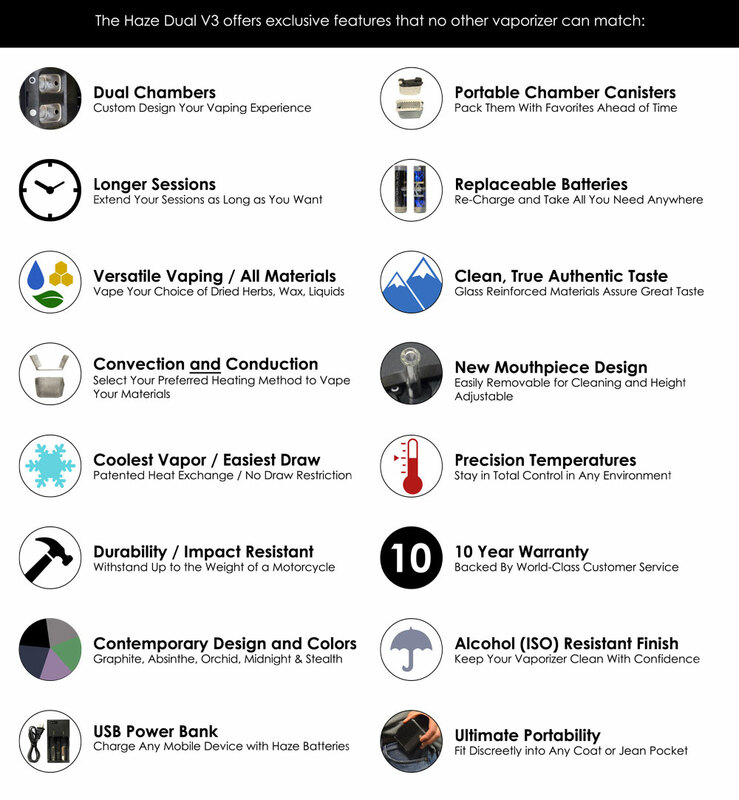 The only other product that comes close is the Hydrology 9 vaporizer, which uses a new liquid cooling vaporizer technology. Cleaning is very easy since the mouthpiece is removable. All you need to do is to remove the mouthpiece, insert a alcohol que tip into the chamber and that’s all it needs for cleaning. 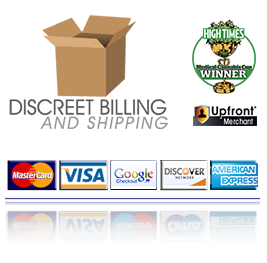 Package comes with a tweezer and shovel tool as well as a two sided brush tool for further cleaning and maintenance. Since your herb has no contact with the heating bowls, the bowls stay clean at all times. All you need to clean is the vapor chamber with some alcohol and a q-tip.